The semantic war of surfaces wages on in Berlin’s eastern city center with skirmishes intensifying in the run-up to the Christmas holiday season. A bootleg medieval village has besieged Schinkelplatz and blockades hastily erected, making a mockery of the square’s architect, Peter Joseph Lené, known for his dramatic employment of visual axis. Strange how the English word ‘festival’, with its Latin roots, cements with the Germanic ‘Festung’, in the sense of a defensive structure. 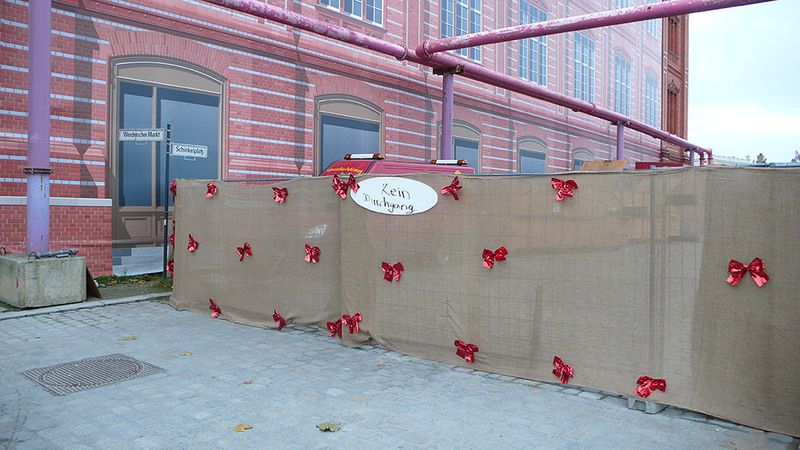 A perimeter fence upholstered in the jute of Sinterklaas’ gift-bearing sack is adorned with gestures of red-foiled cheer and the dispirited Glühwein-soused scrawl of an elfen scrivener armed with an Edding 850. “No passage!” declares the sign, encouraging the outward detour, whilst the passage of the city’s drinking water is redirected unabated, meters above the mêlée in pink tubes. The plastinated corpse of Schinkel’s Bauakademie skulks indifferently, resigned to its role as an un-dead set-piece for some passing carnival – from the Latin incidentally, for the dispatching of flesh.